Myasthenia gravis is a chronic autoimmune neuromuscular disease characterized by varying degrees of weakness of the skeletal (voluntary) muscles of the body. The name myasthenia gravis, which is Latin and Greek in origin, literally means "grave muscle weakness." With current therapies, however, most cases of myasthenia gravis are not as "grave" as the name implies. In fact, for the majority of individuals with myasthenia gravis, life expectancy is not lessened by the disorder. The hallmark of myasthenia gravis is muscle weakness that increases during periods of activity and improves after periods of rest. Certain muscles such as those that control eye and eyelid movement, facial expression, chewing, talking, and swallowing are often, but not always, involved in the disorder. The muscles that control breathing and neck and limb movements may also be affected. Autoantibodies (immunoglobulin G [IgG]) develop against ACh nicotinic postsynaptic receptors for unknown reasons, although certain genotypes are more susceptible. Cholinergic nerve conduction to striated muscle is impaired by a mechanical blockage of the binding site by antibodies and, ultimately, by destruction of the postsynaptic receptor. Patients become symptomatic once the number of ACh receptors is reduced to approximately 30% of normal. The cholinergic receptors of smooth and cardiac muscle have a different antigenicity than skeletal muscle and are not affected by the disease. The role of the thymus in the pathogenesis of myasthenia gravis is not entirely clear, but 75% of patients with myasthenia gravis have some degree of thymus abnormality (eg, hyperplasia in 85% of cases, thymoma in 15% of cases). Given the immunologic function of the thymus and the improvement in the clinical condition of patients following thymectomy, the thymus is suspected to be the site of autoantibody formation. However, the stimulus that initiates the autoimmune process has not been identified. Muscle weakness caused by myasthenia gravis worsens as the affected muscle is used repeatedly. Since symptoms typically improve with rest, your muscle weakness may come and go. While myasthenia gravis can affect any of the muscles that you control voluntarily, certain muscle groups are more commonly affected than others. •	Speaking. Your speech may be very soft or sound nasal, depending upon which muscles have been affected. •	Swallowing. You may choke very easily, which makes it difficult to eat, drink or take pills. In some cases, liquids you're trying to swallow may come out your nose. •	Chewing. The muscles used for chewing may wear out halfway through a meal, particularly if you've been eating something hard to chew, such as steak. •	Facial expressions. Family members may note that you've "lost your smile" if the muscles that control your facial expressions are affected. Myasthenia gravis can cause weakness in your arms and legs, but this usually happens in conjunction with muscle weakness in other parts of your body — such as your eyes, face or throat. The disorder usually affects arms more often than legs. However, if it affects your legs, you may waddle when you walk. 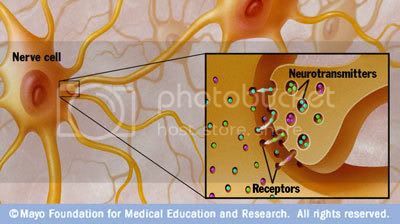 Chemicals messengers, called neurotransmitters, fit precisely into receptor sites on your muscle cells. In myasthenia gravis, certain receptor sites are blocked or destroyed, causing muscle weakness. The thymus gland, a part of your immune system located in the upper chest beneath the breastbone, may trigger or maintain the production of antibodies that result in the muscle weakness common in myasthenia gravis. Your nerves communicate with your muscles by releasing chemicals, called neurotransmitters, which fit precisely into receptor sites on the muscle cells. In myasthenia gravis, your immune system produces antibodies that block or destroy many of your muscles' receptor sites for a neurotransmitter called acetylcholine. With fewer receptor sites available, your muscles receive fewer nerve signals, resulting in weakness. It's believed that the thymus gland, a part of your immune system located in the upper chest beneath the breastbone, may trigger or maintain the production of these antibodies. 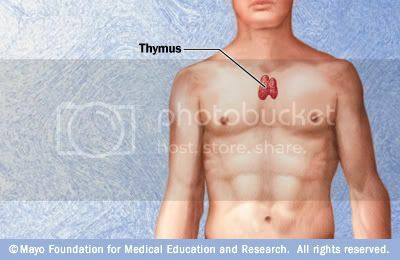 Large in infancy, the thymus is small in healthy adults. But, in some adults with myasthenia gravis, the thymus is abnormally large. Some people also have tumors of the thymus. Usually, thymus gland tumors are noncancerous. Still you are Non-Member ? Come on ! Why to be as as a Guest. This Site is only for you dear. So, become a member Right now and Enjoy the MG.
Last edited by trimurtulu; 02-15-2009 at 10:16 PM.